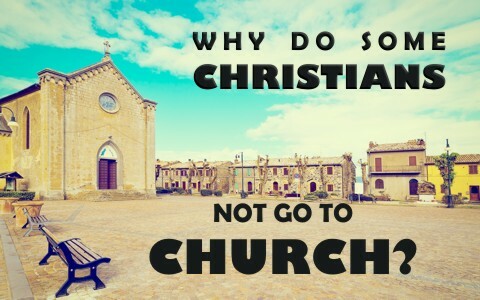 Why Do Some Christians Not Go To Church? What are the reasons more and more believers are not going to church today? The author of Hebrews writes, “Let us hold fast the confession of our hope without wavering, for He who promised is faithful; and let us consider how to stimulate one another to love and good deeds, not forsaking our own assembling together, as is the habit of some, but encouraging one another; and all the more as you see the day drawing near” (Heb 10:24-25). Notice there are 5 references to “us,” “our,” or “one another,” so the word assembling is especially important in these verses. The word translated into “assembling” is from the Greek word “episynagōgē’ and it means, “a gathering together in one place.” It’s impossible for one person to “gather together.” One person can’t assemble any more than one piece can assemble and make a completed picture puzzle. Each piece of the assembling of the saints is vital. If one piece is missing, it’s incomplete. Jesus needs all members to be in place to do His will and His work through us. When someone tells me (as they have, many times), “I’ve been hurt, so I don’t’ go to church anymore,” I can plainly tell them, “I’ve been hurt too. In fact, I was nearly killed a few years ago in an auto accident, but I’m not about to stop driving. I can’t. It’s essential for my family’s survival.” Paul dealt with a lot of hurt in the churches he wrote to, especially the one in Corinth, but Paul didn’t write these letters (epistles) to have them copied and mass mailed to each home. He sent them out to specific churches, like to the church at Galatia, where he wrote, “For you have heard of my former life in Judaism, how I persecuted the church of God violently and tried to destroy it” (Gal 1:13). Paul doesn’t refer to individuals being persecuted, but the church being persecuted. That’s because Jesus connects Paul’s persecuting the church as persecuting Him (Acts 9:4-5). If we are criticizing our brothers and sisters in the church, even to the point of persecuting them because they belong to a church (which happens), then we are persecuting Christ Himself. You can say you love God but when you can’t stand to be around God’s children, what does that tell God? I’m a father and grandfather, and if someone says, “I love being around you, but I can’t stand being around your children because they’ve hurt me before,” I have to admit, I don’t think I’d like that very much. I would acknowledge my children’s wrongdoing, but I’d also remind the person that “God’s forgiven them…but have you?” If Jesus asks you why you forsook the assembling of the saints, which is clearly commanded in the Bible, do you think Jesus will accept, “I’ve been hurt before.” We shall all stand to give an account, and when we stand alone for our rewards or loss of rewards, we can’t tell Jesus, “Wait Jesus, I want to bring in some people from your church who hurt me…they’re the reason I stopped going to church.” No, that’s why it says, we shall all stand before God, not “we shall all stand together before God.” We might not actually say we hate our brother or sister, but if we can’t stand to be around them, something’s wrong. Doesn’t every one of us fall infinitely short of God’s glory (Rom 3:23)? Imperfect as they are, and as imperfect as I am, aren’t they (and we) still God’s children for whom God sent His Son to die? Will you still be on no speaking terms when you see them in heaven? Eternity’s a long time to not talk to someone! If you love God, and love spending time with God, then you should naturally love spending time with God’s people. I believe one man told me there are over 50 references to “one another” in the New Testament alone, not counting the gospels, and the Body of Christ needs these “one another’s” to be there with us to go where Jesus commands the church. The hand doesn’t do very good at home alone. All he could do was flip the remote, but without an eye, he couldn’t’ even see what was on TV! I hope you see my point. When the Apostle Paul wrote to the church at Corinth, he addressed it, not to individuals scattered around the area in their homes, but specifically, “To the church of God that is in Corinth, to those sanctified in Christ Jesus, called to be saints together with all those who in every place call upon the name of our Lord Jesus Christ, both their Lord and ours” (1st Cor 1:2), and later in this same letter, “For I am the least of the apostles, unworthy to be called an apostle, because I persecuted the church of God” (1st Cor 15:9). I find it interesting when people say that the church is no longer relevant because I find the church in the Book of Revelation at the end of the age, where Jesus tells John to write about them. Does a person “worshiping God” at home have the sacraments like communion, do they visit the sick, feed the poor, clothe the naked, and go out into the world or community to make disciples of all people as we’re commanded to do (Matt 25:35-56, 28:18-20)? Who holds the offices of pastor, or teacher, or elder, or deacon that God has placed in the church in His good pleasure? Who collects offerings for the ministry, if there is one? The New Testament reveals that there are no churchless believers, and no lone rangers, so I don’t believe there should be today. Jesus said the gates of hell (death) will not prevail (stop) the church (Matt 16:15-20). Jesus said He will build His church…and nothing will stop it…not the changing times, not the falling away, and not the Devil himself. Having said that, in many places around the world, churches cannot gather together because they may be illegal, therefore they must meet in their homes, and sometimes, meet underground. It may be too dangerous to attend as a group, but for most in the West, this is not the case. Years ago, there was a lady who was on a church board and served as secretary, but she began attending sporadically, and this meant the church had to find someone else to take notes, and sadly, this woman kept the minutes of the previous meeting with her, so when she wasn’t there, it hurt the church. They had to try to remember what they covered at their last meeting. This was even more frustrating because this lady only lived 4 blocks away from the church, but well over half the time, she’d say, “I can’t make it to church today.” Do you think Jesus was most precious to her? I must ask myself the same question. Years ago, I remember hearing an Adrian Rogers’ sermon, and he spoke of a man who had an experience on a Wednesday night Bible study. He said, it was a drizzly, rainy night out, and only 5 of the 113 in the congregation showed up. Apparently, most people didn’t bother to come out in that kind of weather, but shortly after the Bible study as the small group was leaving church, they saw a fire in the distance, so the five of them got in the car and headed out to see what was burning, and there…standing in the rain, were about 150 people watching a house burn down…while they were standing in the rain. And well over half of the congregation was standing there in that crowd. Sadly, the pastor reasoned, “They “couldn’t” travel a few blocks to come to a one hour Bible study on a rainy night, but they were willing to stand in the rain for over an hour and a half and watch a neighbor’s house burn down.” The question is: “Is Jesus really precious to them? Does it look like it?” We have some in our church who are just a few blocks away who just can’t manage to come, while others travel more than 20 miles, and they come…rain or shine. Related reading for you: Why Do More Women Attend Church Than Men? Next post: What Are The Characteristics Of Good Service?